Kiki Athanassiadis (born Montréal, Canada) completed her MFA studies in Toronto and is currently living and working in Windsor, Ontario. One of her recent projects explored the collaborative aspects of the printmaking studio. 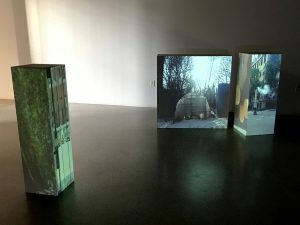 Her participatory project Desire and the City: a citizen’s abandoned lot design consultancy was presented at Civic Space in 2013, and was also part of the 2014 Triennial exhibition, at the Art Gallery of Windsor.